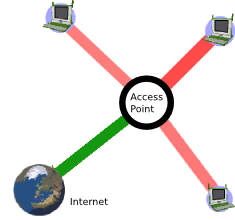 A computer network is a grouping of connected computers. Networks are typically described by their scale: local-area network (LAN) covering a small geographic area, like a home, office, or building; wide-area network (WAN), covering a relatively broad geographic area (such as one city to another and one country to another country), Metropolitan-Area network (MAN) connecting multiple local-area networks together but not extending beyond the boundaries of the immediate village, town, city or area. Sometimes networks are described by the hardware that connects the computers: satellite, optical fiber, Ethernet, wireless, and so on. Some networks use physical connections—wired—while others use radio waves—wireless. You can name a network based on its functional relationship: client-server and peer-to-peer are good examples. Finally, you can talk about networks by topology. Topology means the logical relations between devices. Examples include: bus, star, mesh, and tree. 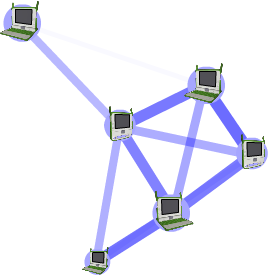 A typical OLPC XO network would be local-area, wireless, peer-to-peer, mesh. However, the XO supports (directly or indirectly) a variety of networks. Simple mesh: XOs talking to each other without Internet access. Infrastructure: XOs connecting to the Internet through a preexisting access point (AP). School server: XOs talking to each other and the Internet through a school server. Part of the OLPC deployment model is to utilize school servers. These servers are designed to provide a gateway to the Internet, a local content repository, back-up, school management, and other local functions. As important as all of these services, their most critical role is to scale the local-area network. Without a school server, the largest network that can be maintained is approximately 20 laptops. Each school server can maintain a network of approximately 120 laptops. By maintaining state information, the school server eliminates the need for much of the multicast traffic, which puts a heavy load in the network. 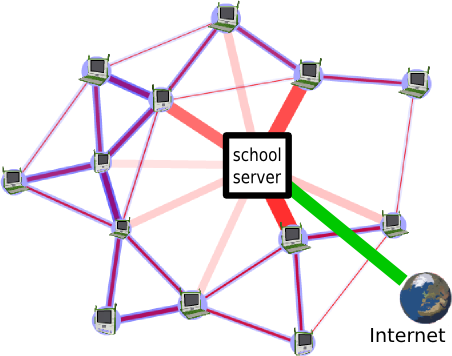 The school server can unify up to three separate mesh channels. The Internet consists of a worldwide interconnection of governmental, academic, public, and private networks. The Internet carries various information resources and services, such as electronic mail, chat, documents, online gaming, and the the World Wide Web (WWW). Although the OLPC ecosystem provides a self-configuring local-area wireless network, connectivity to the Internet is something that needs to be worked out on an individual basis. a wireless mesh network is a communications network made up of radio nodes in which nodes can forward information on behalf of each other so that even nodes that are not in direct radio contact can communicate via nodes that are between them. The collective coverage area of the radio nodes working as a single network becomes a mesh cloud. an AP is a device that connects wireless communication devices together to form a wireless network. The AP usually connects to a wired network and can relay data between wireless devices and wired devices. Several APs can link together to form a larger network.